The second generation Cintral software represents the latest in modular design and ease of use. 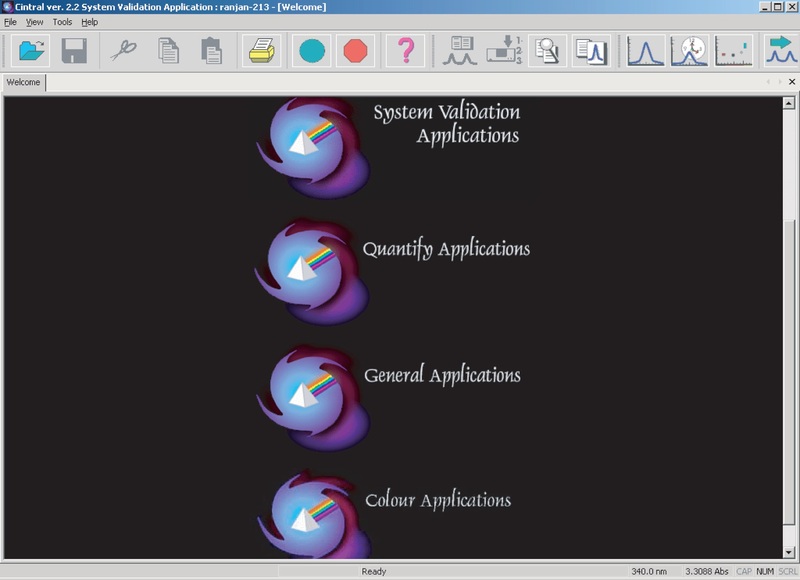 Among the many features available, applications such as General, Quantify, Kinetics, DNA Melt, Colour, Scripting and System Validation Applications, are also included as part of the standard package. System Validation Application for performance verification and IQ/OQ requirements. Peak and Valley find feature. Scan Calculator allowing calculations such as addition and subtractions of scans, as well as derivatives, sine, etc. Report Generation and printing of results to any printer supported by Windows®. Data export to text format for importing to Excel or other data analysis packages or .xml format. Auto recognition of accessories when connected. Control of automatic cell changers – 6×1, 6×6, 7×7. Control of Sipper and auto samplers – SDS-720.